Mac dedicated "PlayMemories Home" enables you to manage and edit photos and videos on your Mac. By uploading photos and videos to our online service "PlayMemories Online", you can also enjoy with photos and videos from your tablet device or smart phone, etc. And of course, you can share photos and videos with your families and friends in a simple way. Let's start with importing photos and videos to your Mac! 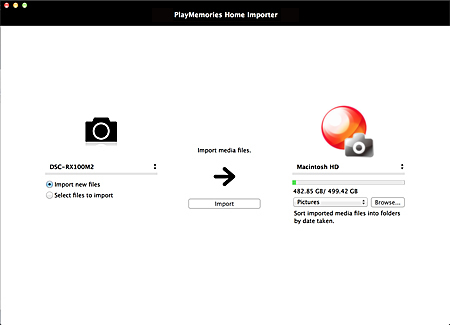 "PlayMemories Home" allows you to import photos and videos which you took, to your Mac. 1. Connect your digital video camera, digital camera or smart phone etc., to your Mac using the supplied or built-in USB cable. Or, insert an external medium like a memory card into your Mac. The photo and video importing screen appears automatically. 2. Import photos or videos by following the on-screen instructions. - Videos are converted to 30p automatically. - To handle MPEG2/AVCHD format videos, connect Sony digital video camera or digital camera, etc.